1. Injuries at the scene: What did squad members describe as the patient’s injuries? Does this match the injuries observed at the hospital? 2. Use of seat belt or broken seat belt: Did the squad members comment on whether the patient was restrained at the time of the accident? Are there comments regarding a broken seat belt, indicating that the patient was thrown violently in the car? 3. Description of car, steering wheel, windshield, seats: A broken steering wheel, a windshield cracked by a plaintiff’s head or broken seats convey the potential for severe injuries to the plaintiff. 4. 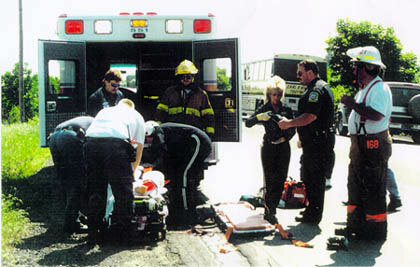 Deployment of an airbag: Airbags can cause powder burns to the face and other acid injuries, traumatic amputation of thumbs, lower head and chest injuries. 5. Plaintiff’s activities at the scene: While a plaintiff may not immediately experience the full effects of his/her injuries, comments such as “Patient was observed walking around at the scene of the accident” may imply that the person was not seriously injured. 6. More than one squad involved in the case: Records may show that a first aid squad and a mobile intensive care unit were both at the scene of the accident. Be sure that all the records of both squads are obtained. 8. Documentation that the squad took photos at the scene: Copies of these pictures should be obtained before this evidence disappears. 1. Who first saw the patient: Usually a triage nurse will see the patient before the patient is officially checked in to the ER. 2. How did the patient arrive at the ER: by car or by squad? 3. When did the patient go to the ER in relation to the accident: Was the patient seen in the ER the same day or was the visit delayed? 5. Complaints of the plaintiff: Were these the same complaints that were documented by the squad? 6. Injuries: If the patient was rear-ended, are low back or cervical spine symptoms documented? (These symptoms may not occur until 24 hours after the accident.) Were lacerations severe enough to be sutured? What x-rays were taken and what did they show? 8. Loss of consciousness: Did the patient report a loss of consciousness at the accident scene? 9. Chronic medical conditions: Look for seizure disorder and transient ischemic attacks (potential for raising questions of liability), arthritis (pre-existing condition), deafness (potential for raising questions on liability), hypoglycemia (drop in blood sugar which may result in lowered attention and may contribute to causing an accident) and glaucoma or cataracts (decreased vision may contribute to the accident). 11. Positive alcohol smell: This may be written as “+ETOH” or “AOB” (alcohol on breath). Some people will misrepresent the amount of alcohol they consumed. Many will never admit to having had more than 2 beers. 12. Blood alcohol level: Know your state’s legal definition of intoxication. 13. Drug screen: If the patient’s blood tested positive for drugs, look at the ER record to determine if any narcotics were given in the ER. Then check the time on the blood test to see when the blood was drawn – before or after the narcotic was given. 14. Level of consciousness (LOC): Did the patient report a loss of consciousness? What was the patient’s LOC in the ER? A patient described as A&OX3 knew who he was, where he was and the date. A&Ox4 means all of the above, plus the patient remembered recent events leading up to the ER visit. This is less commonly used than A&Ox3. 15. Glasgow Coma Scale: A scale of 15 is the highest possible score. A patient can be dead and have a score of 3. 16. What did nurses observe about the patient? What symptoms did the patient experience while in the ER? Was the patient’s behavior congruent with the injuries, or did the nurse document symptoms that would cast doubt on the seriousness of the injuries? 17. Were the appropriate,taken based on the plaintiff’s complaints? 18. Were x-rays read by the radiologist or only by the ER doctor initially? : All ER x-rays must be ‘over-read’ by a radiologist later. 19. Did the patient receive discharge instructions? Were they written or oral? Did the plaintiff sign that instructions were given? 20. Was the plaintiff instructed to seek care from the PMD (Primary Medical Doctor)? Was this done? 21. Was a prescription given? What type of medication was it? Careful review of the records created by the rescue squad and emergency department staff will give you a firm foundation for understanding the injuries the plaintiff sustained. This information can be used to substantiate or refute later claims of damages resulting from an accident.